Heat gas or charcoal grill for indirect cooking. Remove and discard neck and giblets from chicken cavity. Pat chicken dry with paper towels. Carefully loosen skin at top of breast. Place butter and green onion whites evenly under skin of breast, without removing skin. In small bowl, mix vegetable oil and grill seasoning. Rub all over outside of chicken. Open beer can; with can opener, make several other openings in top. Measure out 2/3 cup beer; discard or reserve for another use. Place half-full can of beer in ungreased shallow 8x8- or 13x9-inch aluminum grill pan. Carefully place chicken cavity over can, pushing until chicken balances in pan. Place on grill over medium heat, making sure chicken is balanced. Cover grill; cook 1 hour to 1 hour 15 minutes or until legs move easily when twisted or lifted and thermometer inserted in thickest part of thigh reads at least 165°F. Brush chicken all over with 1/4 cup Buffalo wing sauce. Cook 5 to 8 minutes longer or until skin of chicken is crisp. With tongs and flat metal spatula, carefully remove chicken and can from pan on grill; place on clean cutting board or serving platter. Carefully remove pan and drippings; let cool, then discard. Let chicken stand 5 to 10 minutes. Twist can to remove from chicken; discard can. Serve carved chicken with green onion greens and remaining ingredients. To bake chicken, place oven rack in lowest position, and heat oven to 375°F. Place prepared chicken on can in lightly sprayed 8-inch square (2-quart) baking dish. Bake 1 hour to 1 hour 15 minutes or until legs move easily when twisted or lifted and thermometer inserted in thickest part of thigh reads at least 165°F. Brush chicken all over with 1/4 cup Buffalo wing sauce. Bake 5 to 8 minutes longer or until skin of chicken is crisp. Let chicken stand 5 to 10 minutes. Twist can to remove from chicken; discard can. Serve carved chicken with green onion greens and remaining ingredients. 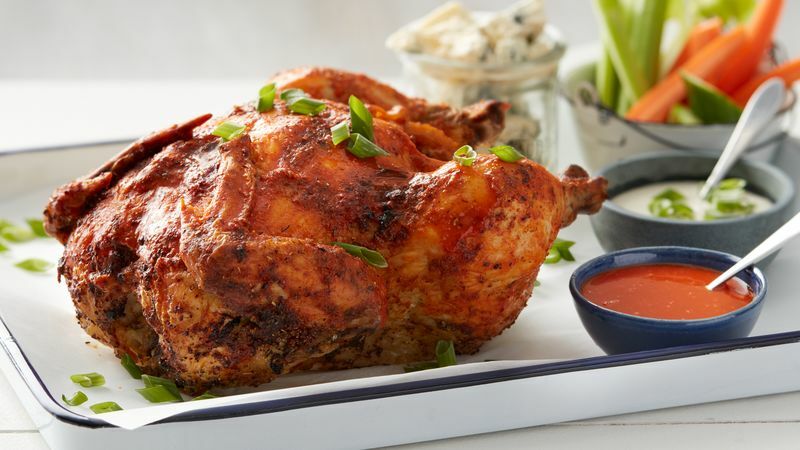 For even more Buffalo chicken-themed fun, serve with carrot and celery sticks. Don’t like blue cheese? Try drizzling piquant blue cheese with a little bit of honey to tame its bite.